My escapades in the world of side saddle riding! No, my saddle isn't going rusty but I have rust on my legs!! For those in the UK who aren't familiar with the North American obsession with rust breeches, it was a popular colour for hunter/jumper riders to wear until "puke green" breeches took over in the late 1980's. Rust is making a comeback in the USA and Canada but the UK has been resistant to this particular colour, although why is anyone's guess as it is flattering for all figure types and for women AND men as well! 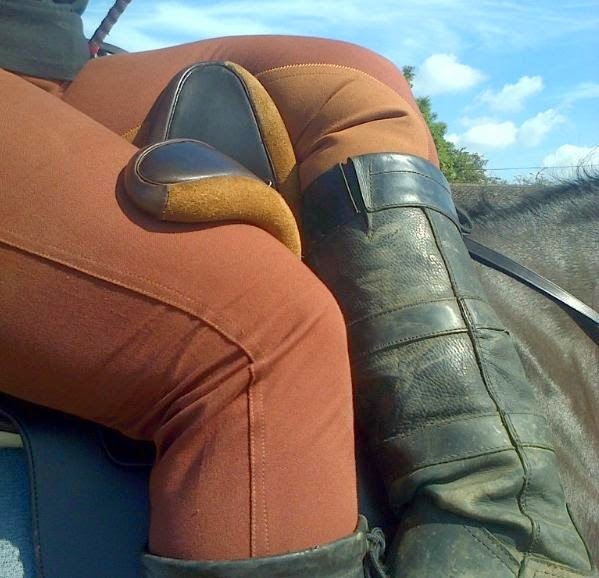 It is a very traditional colour and always thought would suit side saddle riding but hard to find or non-existent in the UK, so was VERY happy when Sarah Parry, from a Bit on the Side Saddle, contacted me to let me know that she had brought out a rust coloured breeches line into her product range! I used to wear rust in the late 1980's and early 90's as a teenager so when my pair arrived in the mail, I felt like a kid again! The Bit on the Side Saddle ones are made from that woven stretch cotton that is really popular with the more expensive breeches (and which I really like!) and they have full clarino seats which are useful for side saddle riding, especially if you have a leather seated side saddle. They aren't the side saddle specific line of breeches that they do with the clarino on the outside if the right leg but normal full seat breeches. This is fine as I ride off-side any ways and you can use them astride too. I ordered the UK size 16/18 and fit well in the hips and thighs and are long enough for me too. I REALLY hate when breeches end mid calf on me, not comfortable AT ALL but these are perfect. I've been wearing mine for two days straight to school Hattie (rust doesn't show the dirt so you can get a couple of day's wear out of them!) and have had good grip in the saddle and not been constricted at all! love the boots, what make are they?